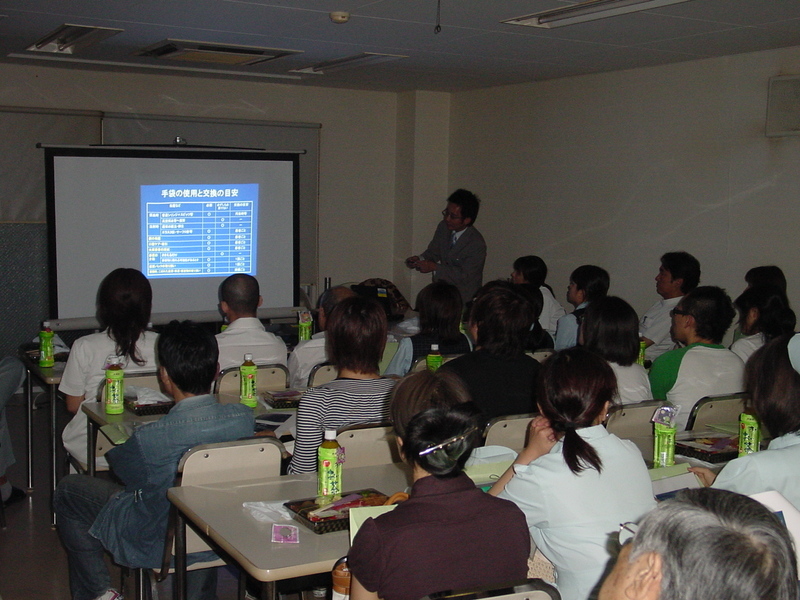 An event of the Matsuyama City Medical Association was held and I've reported it in this blog before. (http://kumo.typepad.jp/weblog/2006/03/bowling-meeting.html) 20 staff members from my hospital joined the event this year and I won 18th place out of more than 200 people. I was in incredibly good condition. Moreover, I got 2nd prize in my hospital. I'll show you both prizes in the picture. 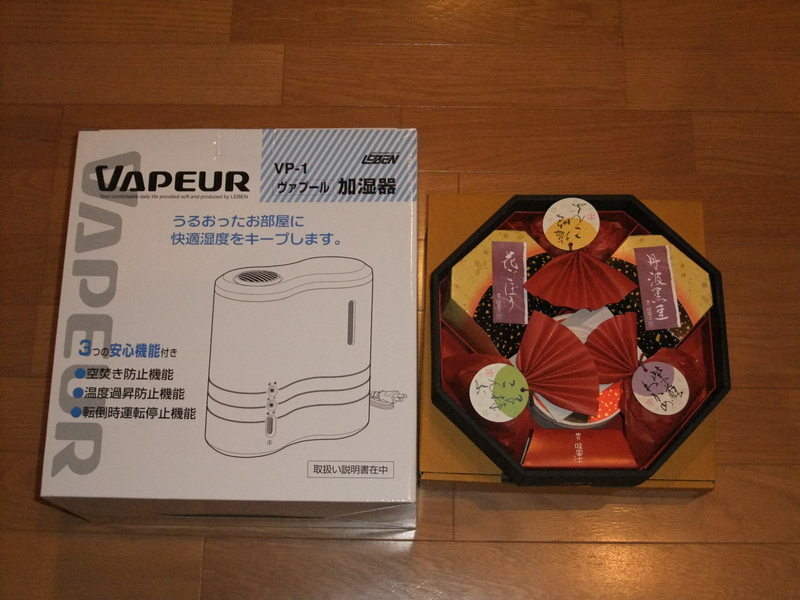 One is a domestic humidifier and another is an assorted "Tsukudani (佃煮)", foods boiled in soy sauce from a long-established company in Kyoto. I bought a new digital camera. 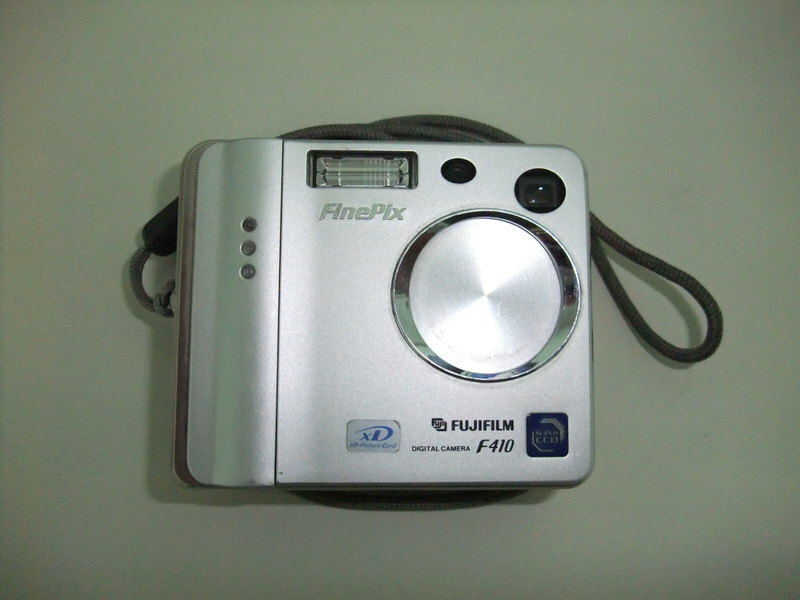 The one that I use now was rolled out in 2003 and still takes good pictures, but the indicator lamps don't work to show when it is on, or being charged. I can continue to use it, but I got new one because when I went up the JR Tower in Sapporo last November, several school kids came to me and asked me to take their picture. It was my pleasure to do so, but the direction that they want me to take it at was not good. I explained that their faces would disappear in the dark due to the sun. They looked like they couldn't understand me, so I took the picture as a trial to show how it would become if it was taken against the sun. However, the picture I took was nice and fine. I was so surprised and felt embarassed. I wasn't aware of how the function of the camera had become remarkably advanced. I decided to renew my camera at that time. I've been examining several cameras from various manufacturers but all of the cameras have the same original functions so it was not easy to choose one. 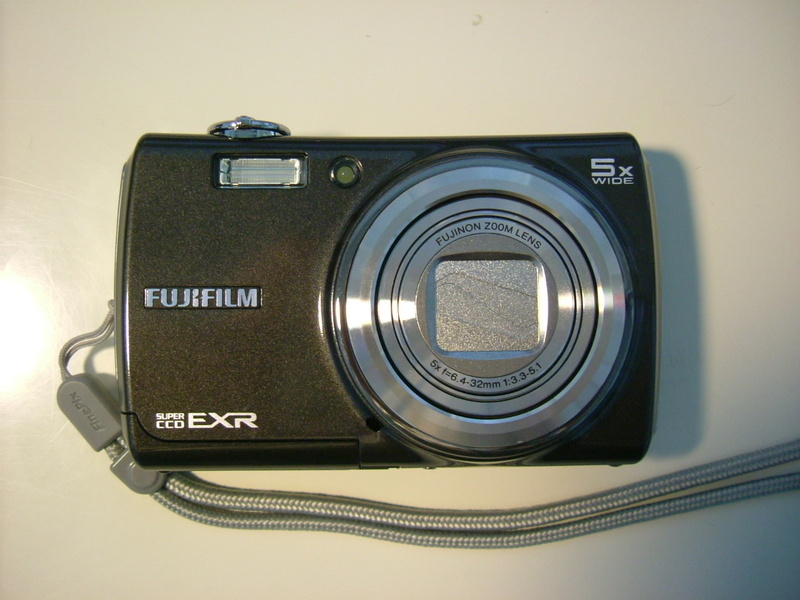 After considering it for a while, I selected one from Fujifilm because my present camera is a product of this company and I thought it would be easier to use one from the same company. Some types of portable PCs are becoming popular in Japan since last summer. A Taiwanese company seems to have sparked the boom. The characteristics are cheaper and limited functional. Roughly speaking, it costs a fourth of a regular notebook PC and has a fourth of the functions of regular one. When I heard about this kind of portable PC, I was skeptical about it. No matter how cheap it is, it seemed pointless not to have high performance. However, to the contrary of my opinion, the media has reported that the sales of this kind of portable PC are increasing. This news hasn't gotton out of my mind for a long time and I checked out several websites and could hear opinions directly from people who had already started using it. Finally, I ended up getting it and am showing you below. I've already used it for a month now. I really think it's nice and useful. It has enough power for netsurfing and exchanging e-mails. I installed a Japanese dictionary and Longman English-English and English-Japanese dictionary. The weight of the pc is only 1 kg. The size of the keys is just fit to my fingers. It connects to the internet via wireless network. 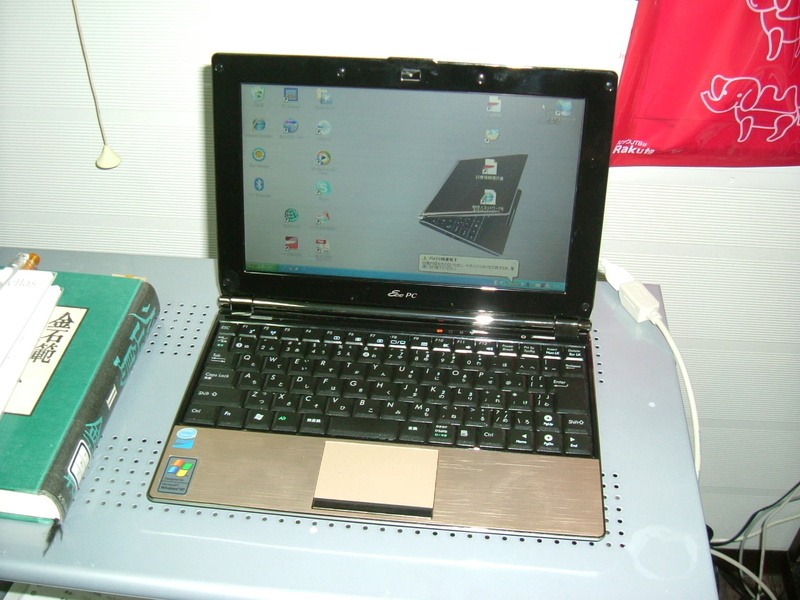 It is also called the net book. It's a good naming , I suppose. It's small enough, light enough and has enough power for me. I am planning to visit South Korea in March. I'm sure I'll bring it and access to the internet. My dog, Mocha, started barking in vain again. He showed the same behaviour just two years ago and I asked a dog trainer for a remedy. The remedy for his bad behaviour was totally successful at that time. When he came back home, he looked like he was under a spell and hardly barked, but now he started barking again, which may be because we have spoiled him. My house is in a secluded place on the outskirts of Matsuyama City. A dog barking can be a big problem here. After the family conference, I took him to a dog school where he was going to be trained with several smart dogs who were being trained to become police dogs. Anyway, I feel sorry to see the garden without him and am looking forward to seeing him again in April. The picture in below was taken last year. It was in my university days when I felt close to Germany for the first time. Japanese medical science was installed from Germany in the Meiji era in an effort to catch up with powerful countries and there still remains an influence of Germany in Japanese medicine today. A lot of medical jargon originates from German. When I was a medical student, I was strictly required to learn German. I studied it very hard and was able to graduate from my medical school. After school, I didn't have any chance to use German in my daily life and my skill got rusty. In one scene a warm-hearted German commander said to the protagonist, "Kommen Sie bitte." It means "Come over here, please." However, the Japanese translation was "来い！" which is "Come on!" in English. The conversation between the German commander and the poor pianist in this scene is a high point of the story. In this scene, the highly-educated German commander starts showing respect to the pianist who looks like a beggar or something. The translation was helplessly mistaken here. 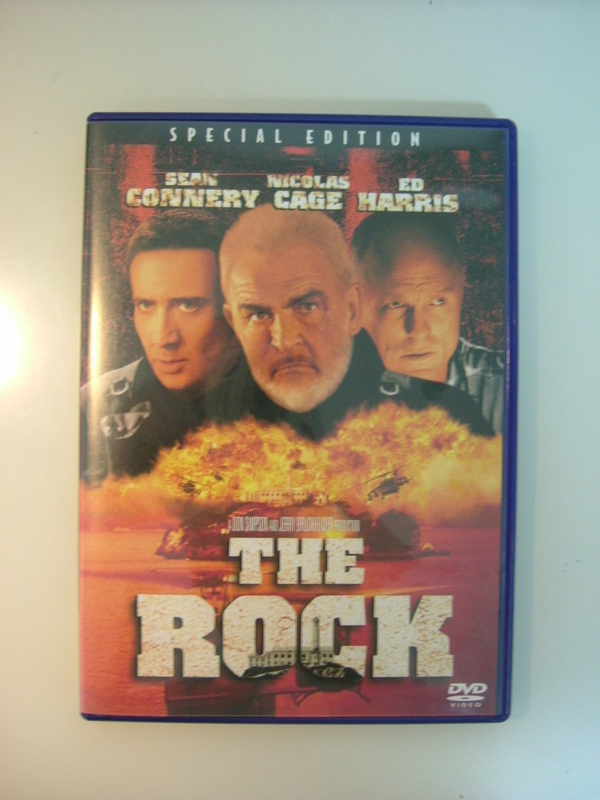 If I hadn't have learned German, I wouldn't have been able to catch the change in attitudes of both of the characters. That's why I restarted learning German. Besides, my second daughter is majoring in German now. It might not be in the so distant future that I'll enjoy skiing in German-speaking countries with my family. 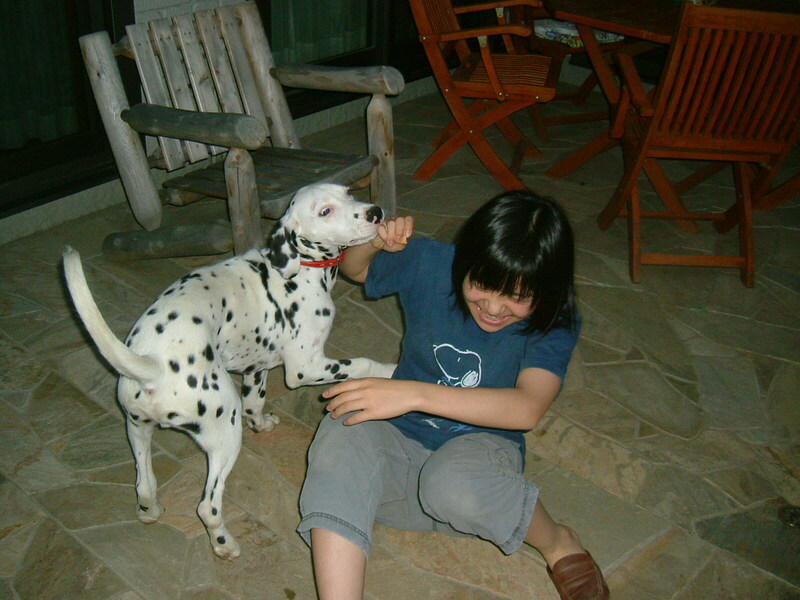 My second daughter and my dog, "Mocha"
The general concern for the outbreak of new types of influenza is growing in Japan. Public facilities such as airports, seaports, train stations, city halls and places like that carry out exercises in a variety of mock situations and emergencies, like the outbreak of new, unknown contagious diseases. The picture was taken in the briefing about sterilization. My hospital holds such briefings regularly to inspire us. Every lecturer is invited to the hospital from outside companies and today's lecturer is from a pharmaceutical company. These briefings begin after our daily work and are a bit of burden, although a box meal is offered to everyone. However, medical science is constantly advancing so I believe it's our duty to refresh our knowledge day by day. The woman in the picture is my daughter, who lives in Tokyo. She sent me this picture the other day. 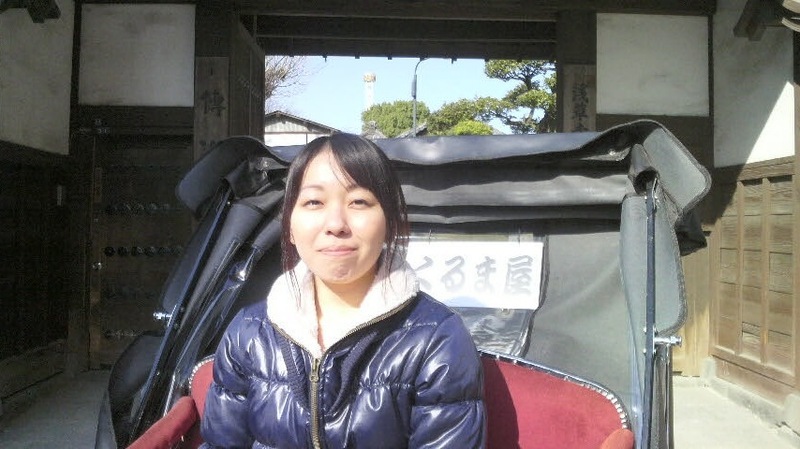 She is on a rickshaw in Asakusa, a famous tourist attraction in Tokyo. Do you know the rickshaw? It's a human-powered vehicle with two wheels. It seems that rickshaws can be seen in various places in the world but the word "rickshaw" is supposed to originate from Japan. 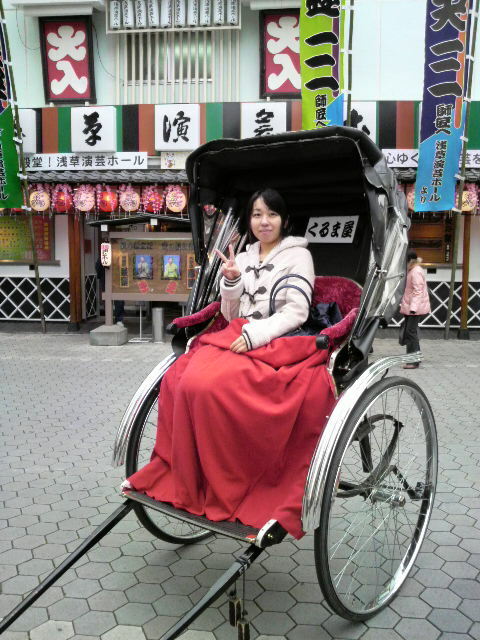 Most rickshaws in Japan are designed for one or two people. The rickshaw in the first picture seats one person. 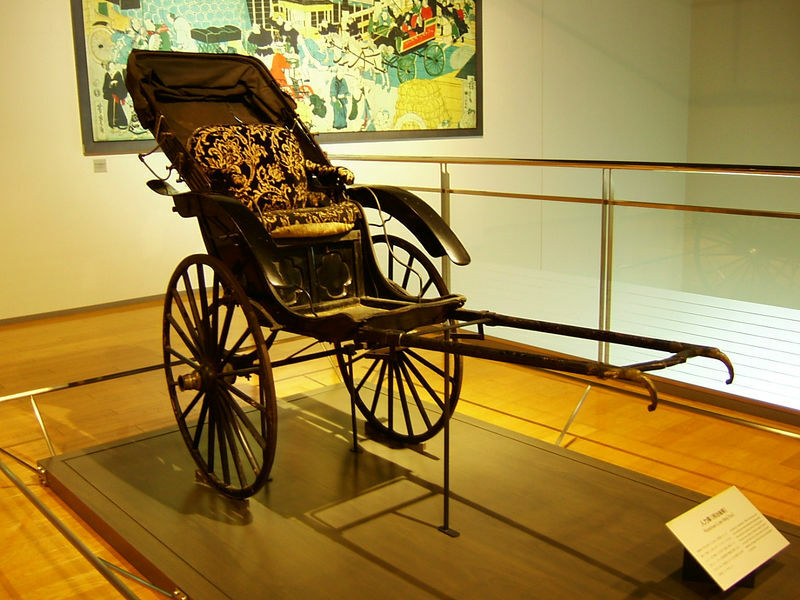 Formerly, the rickshaw was one of the forms of transport and rickshaw men had to be tough and powerful enough to pull their rickshaws. At present, however, they are required to show the tourists around. Asakusa has old town elegance and its own history. There are some famous tourist spots in the area. The present rickshaw men have to learn Japanese culture, traditional things and need to have a litle knowledge of foreign languages. Then, there becomes a problem of who judges the rickshaw men's knowledge and attitude to the customers. As the rickshaw man is often away from the rickshaw station, taking his customers to visit tourist spots and giving explanations about the sights, it is not possible for the supervisor to monitor the level of service being provided. My daughter's task, commissioned by the rickshaw company, is as a kind of tester of the rickshaw men. She gets on the rickshaw, as indicated by the company, and talks to the rickshaw man, who is usually newly hired. After that, she reports her remarks to the company. Needless to say, the rickshaw man doesn't know she is a tester. 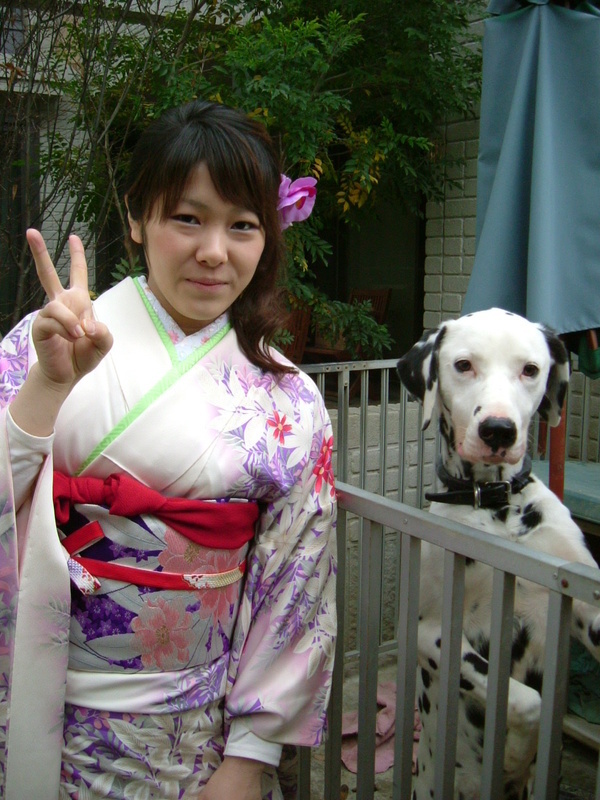 Japanese culture is her subject and she can talk in English, French and Korean. This task isn't hard for her, besides she looks like she is enjoying sightseeing. It's a real juicy job, I think. What do you say? It's not so common for me to write about this kind of fish as a topic of my blog and you can see how it is in the following picture. Yes, it's a kind of shark. 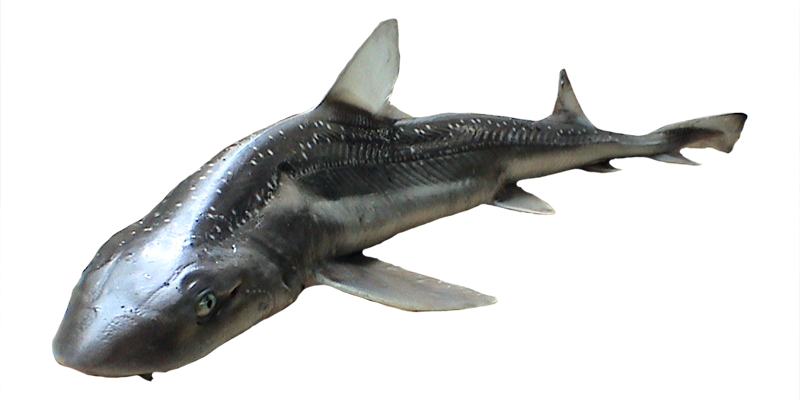 I live in Ehime Prefecture in the southern part of Japan, and especially in southern Ehime, this shark has been eaten for a long time. The name of this local cuisine is "Fuka no yuzarashi". I'm addicted to it. Starspotted smooth-hound is called "Fuka" in Ehime. You strip the starspotted thin membrane off the skin of a fresh one first and fillet it with its whole skin. Next, you slice it into what you call sashimi in Japan, then blanch it in the boiling water, and lastly immerse it in iced water. When you eat it, you dip it in the fermented soybean paste blended with mustard. This cuisine is essential for ceremonial occasions such as coming of age, marriage, funeral and ancestral worship in Ehime. 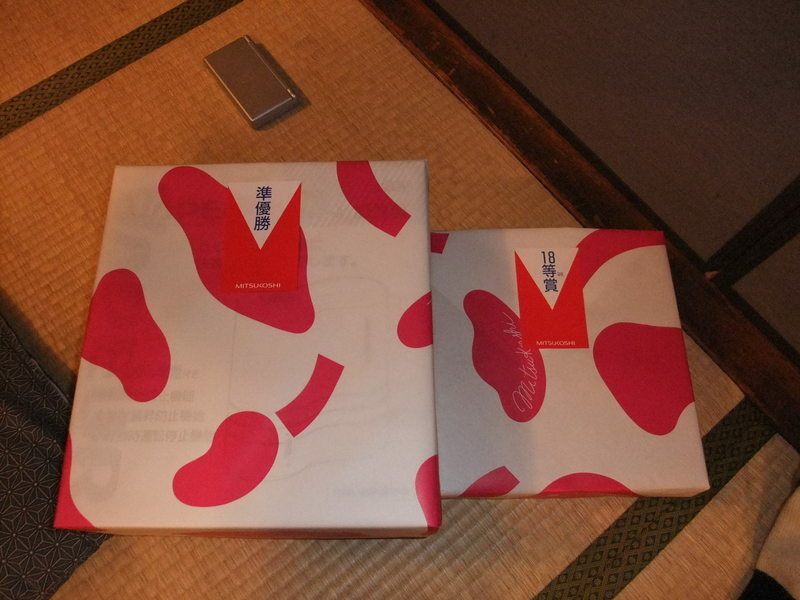 The bland taste of "Fuka" is well blended in with a spicy paste and it stimulates our appetite. 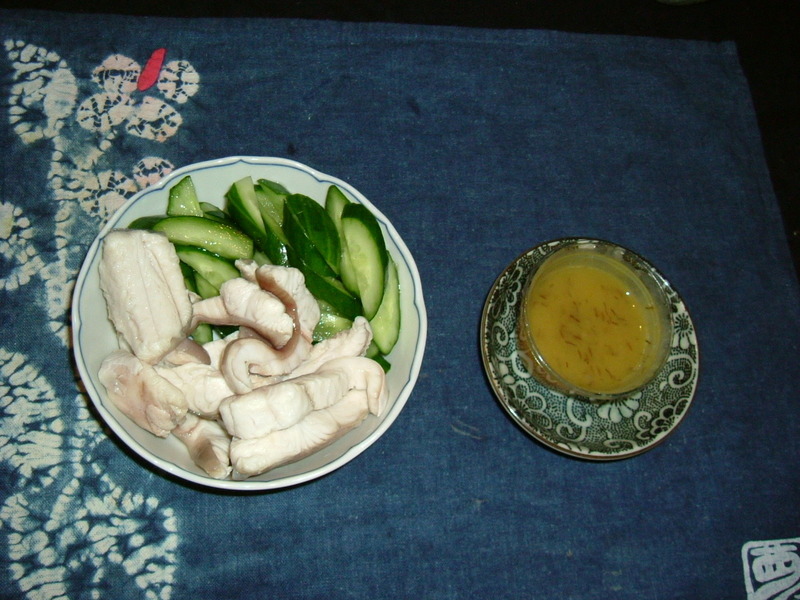 It can be more colorful and tasty with tofu, cucumber, konjaku and other vegetables. I wonder where else people eat similar dishes in the world. If you asked me which president of the U.S. I feel most familiar with, I'd answer it is ex-president Jimmy Carter. It is because I met him in Shimoda City in Kanagawa Prefecture in 1978 or 1979. A meeting between college students and him was scheduled in his first official visit to Japan and I was one of the students. 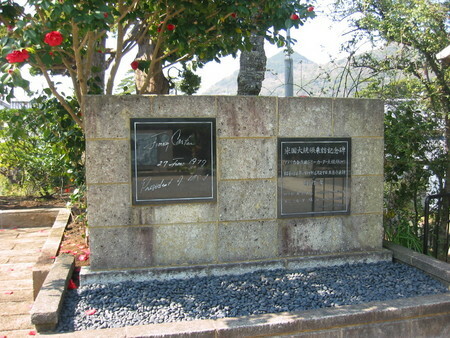 The picture is the monument of his visit and it stood in Shimoda City. I had been learning English for 6 or 7 years at that time and I thought I could understand at least 20 percent of his speech, but it was just an illusion. I couldn't catch his words at all. I was so disappointed at my English skill. I studied English very hard to pass the entrance exam of one of the best universities in Japan. Years later, when I listened to the inauguration address of Ronald Wilson Reagan, which was so beautiful and clear, I figured out the reason why I couldn't understand Carter's speech. It was due to his dialect and inflection. Anyway, I had a sense of closeness to him and had paid attention to his policies during Carter's presidency. The society at that time wasn't like today's IT society and my sources were only newspapers and TV news. Therefore, my opinion might be biased. However, I think it was President Carter that developed the present situation of Afghanistan. President Carter was elected in a mood of weariness towards war and approval of becoming weak just like now. He planted the seeds of distrust in Asia, seeking withdrawal of U.S. troops from the Republic of Korea. He didn't intervene in Mozambique, made a serious mistake in Iran and ended up allowing the Russian invasion into Afghanistan. I wondered if he might be an ordinary farmer living in a sleepy village. Don't you think that the situation of Obama is similar to that of Carter? President Obama was born from the peoples' revulsion against a war. When he announced his candidacy, he was obscure just like Carter. Both presidents are Democrats and didn't and don't have enough experience. I'm afraid that the U.S. will collapse day by day during next 4 years and something serious for the human history will happen just like during Carter's presidency.